Are you new to working with Gantt charts? 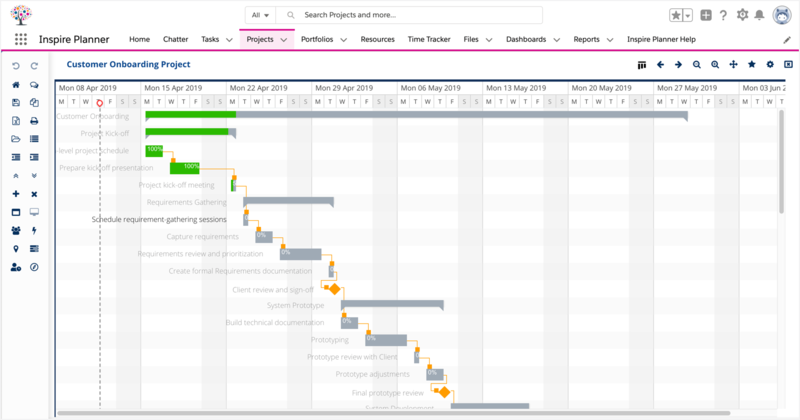 This article helps you understand the basics of the Inspire Planner Gantt chart, and how to best use it with your project. Let's get started! A Gantt chart is a type of bar chart that illustrates a project schedule. Gantt charts also show the dependency relationships between tasks/activities. 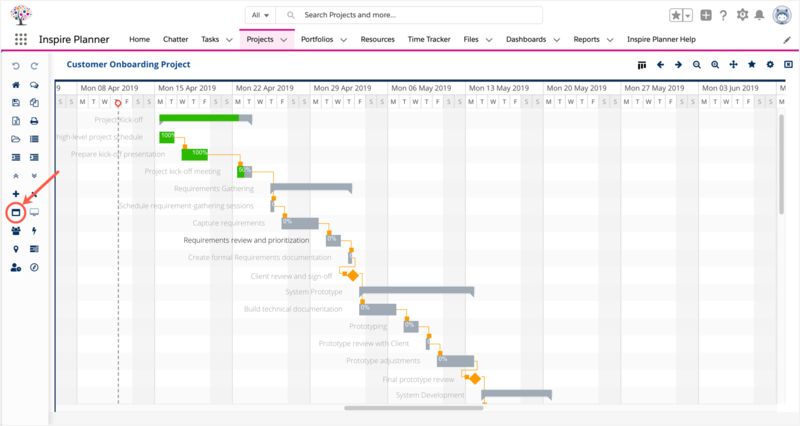 The Inspire Planner Gantt Chart helps you to visualize your project schedule, the relationships between tasks and project milestones. 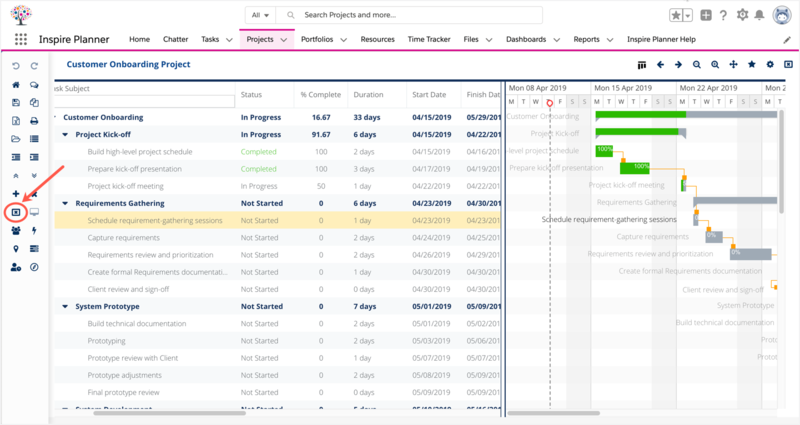 When you open a project, the Inspire Planner Interface displays your project tasks on the left and the Gantt Chart on the right. 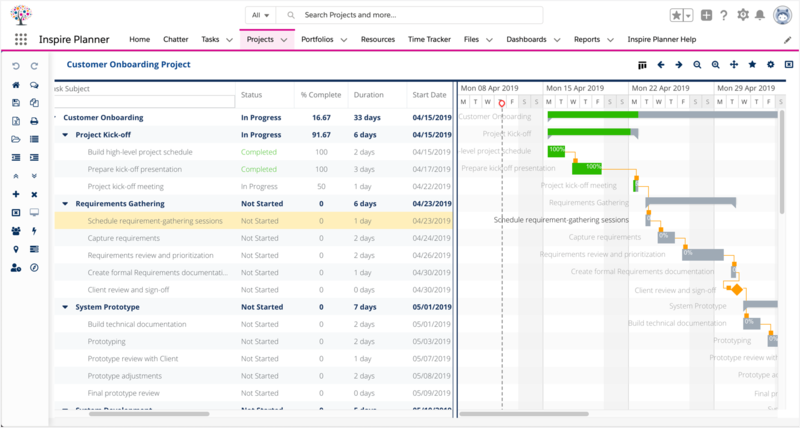 As you create project tasks, specify Duration, Start and Finish Dates, Predecessors, and % Complete, you will notice that Inspire Planner automatically plots the information on the Gantt Chart. 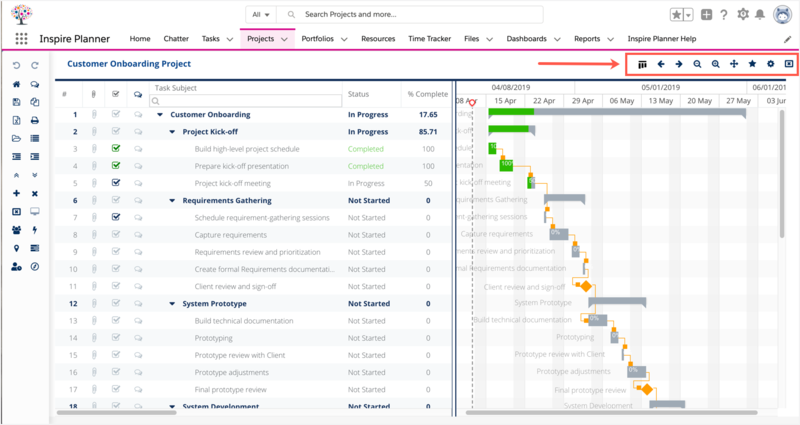 You can hide the project task list on the left in order to better see the Gantt chart. To hide the project task list, click on the Hide Project Task List icon in the project toolbar on the left. 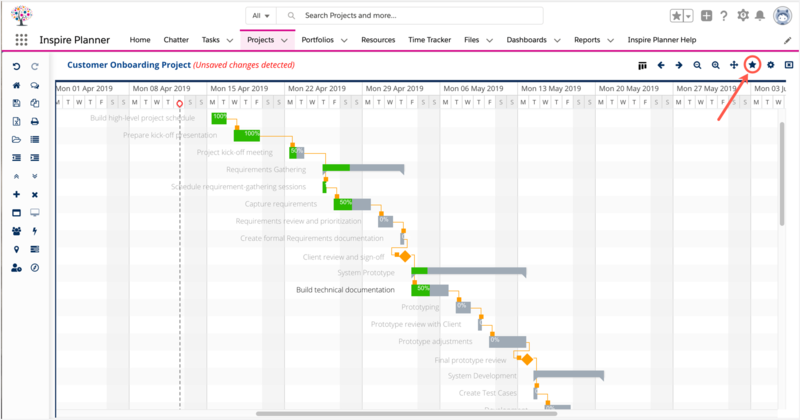 Once the Project Task List is hidden, the Gantt Chart takes up the full interface. To display the Project Task List, click on the Display Project Task List icon in the project toolbar on the left. Now let's go over the Gantt Chart Toolbar to help you navigate within the Gantt Chart. 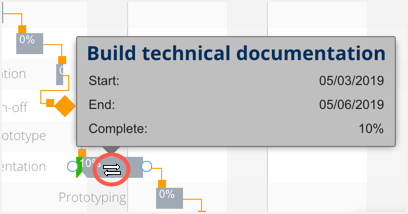 The Gantt Chart Toolbar is located at the top right corner. See below for a brief description of what each icon does. Zooming in and out on a timeline means that you are zooming in and out of a specific unit of time. Every time you click on zoom in on timeline, it will zoom you in on a smaller timeframe (i.e. months, then weeks, then days, then hours). Likewise, every time you zoom out on the timeline, it widens the timeframe (i.e. hours, then days, then weeks, then months, then quarters, then years). 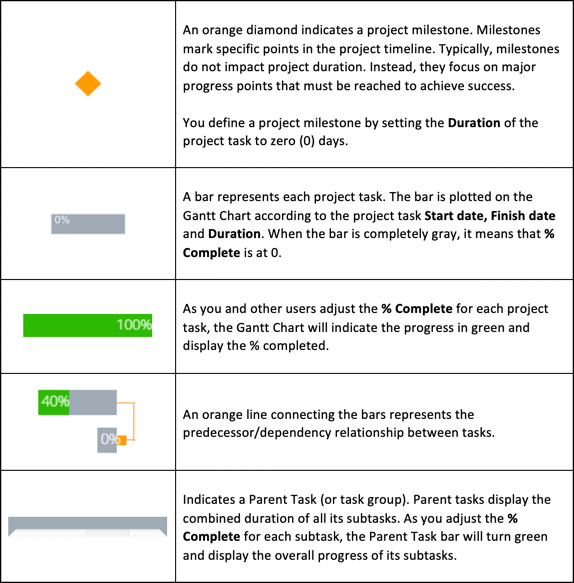 This allows you to visualize your project schedule more easily based on the duration unit you have specified for each task. As you work with the Inspire Planner Gantt Chart, you will notice different styles of bars, colors, symbols and lines. It is important that you become familiar with their meanings. 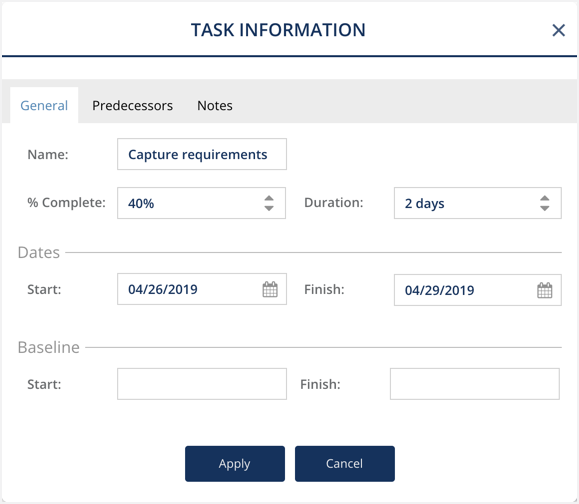 You can perform certain actions within the Gantt Chart such as define predecessor relationships and add lag time, view task information, change start and finish dates, adjust duration, and specify % completed. You can define predecessor relationships and add lag time between tasks within the Gantt Chart. For more information, see Managing Predecessors in the Gantt Chart. To view Task Information, double-click on the bar associated with the task you wish to view. A pop-up window will appear where you can view and edit General information, Predecessors, and Notes. Click on Apply after you make your changes. Remember to click on the Save Project Plan icon to save all of your changes. You can adjust a task's Start Date and Finish Date by moving the bar on the Gantt Chart. First, click anywhere on the Gantt Chart. Then place your cursor on top of the bar representing the task you wish to adjust. Your cursor will change into a bi-directional arrow. You can then drag the bar horizontally to move it between dates. As you move the bar horizontally across the Gantt Chart, you'll notice that the Start and End dates in the tooltip adjust accordingly. You can also adjust the duration of a specific task within the Gantt Chart. First, click anywhere on the Gantt Chart. Then place your cursor on top of the bar representing the task you wish to adjust. Move your cursor toward the end of the bar (if you wish to adjust the duration by adjusting the End date) or the beginning of the bar (if you wish to adjust the duration by adjusting the Start date). Your cursor will change into an arrow. You can then drag one end of the bar horizontally to adjust the duration. As you adjust the bar horizontally, you'll notice either the Start or End date in the tooltip adjusts accordingly. The Gantt Chart also allows you to specify the % Completed for each task. First, click anywhere on the Gantt Chart. Then place your cursor on top of the bar representing the task you wish to adjust. Move your cursor to the bottom of the % Completed indicated on the task bar. You will notice a small white triangle at the bottom and your cursor will change into a double ended arrow. Drag it across the task bar to adjust % Complete. As you adjust the bar horizontally, you'll notice the % Complete in the tooltip adjusts accordingly and the task bar is highlighted in green to represent the progress. 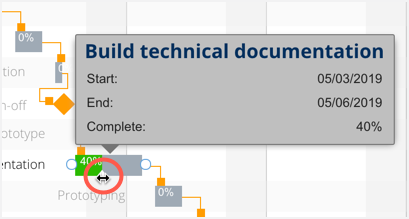 Always remember to save your changes after any action you perform on the Gantt Chart. Click on the Save All Project Tasks icon to save.